This is just the tip of the recreational iceberg, however. Aside from its namesake, Royal Billiard offers everything from foosball and air hockey to Skee-ball and video games such as Golden Tee and the “multi-cade,” which features 60 retro arcade games such as Pac-Man and Galaga, all in a fun, colorful, and functional cabinet. That is to say, Royal Billiard offers all the fun a person could want in a game room, plus décor, lighting, hot tubs, grills, accessories and so much more. We spoke with Audra about these, as well as important factors to consider when looking to turn one’s home into an entertainment destination. What are some factors to consider when thinking about adding a pool table to a home? Access to a room isn’t as important as most people think, because most tables come disassembled and are put together on site. Room size is very important, though, because you do need space for the cue around the table to play comfortably. You don’t want to be butting up against the wall. The standard 8-foot pool table needs a minimum room size of 13 feet 4 inches by 17 feet. That is just enough with a full-length cue. From there, cue sizes go down about every six inches. A standard cue is 57 or 58 inches in length. Then the measurements drop to 52, 48, 42, and shorter from there on. We sell short cues down to 2 feet for tight spaces. The smaller cues don’t feel like toy cues, though. They are weighted so they feel and play more like standard-sized cues. How much should a person expect to spend on a pool table? For our new tables, we only carry American-made options. A client can expect to spend in the range of the mid-$2,000s and up. This includes a custom finish, choice of cloth, as well as delivery and setup. We also offer a lot of gently used tables as well. We have some of those starting around $1,500 and up. This also includes delivery, installation, and choice of cloth for a table that will look brand new. What types of customization options are available? We have quite a few. We get our tables from Olhausen, the largest pool table manufacturer in the U.S., which is located right outside of Nashville, Tenn. Options are very customizable, because this is all they do. A customer can order anything from multiple finishes to custom legs to custom sights—the three circles/diamonds on top of each rail. Customers can order abalone, metal, pearl, even custom engraving. There are also about 25 colors of cloth to choose from, as well as choice of leather for pockets. Finish choices are better now than ever. There are weathered grays for a shore home or rustic, light pine for mountain homes. There is a very broad selection of wood species for finishes, such as pine, oak, cherry, maple, and more. We have the ability to offer a variety of styles to suit any décor. We can have pool tables made with pine log legs, as well as light gray, and trimmed-down looks for a more contemporary, clean look. We are very adaptable to the different kinds of designs required for different areas. Besides pool tables, what trends are popular right now in home gaming? Probably the most popular comeback game of this century is shuffleboard. When we opened the business in ’82, and through the mid-’90s, we sold a lot of shuffleboards. They died out for about a decade, but these days we sell an unbelievable amount of shuffleboard tables. It’s easy to play for anyone, age 5 or 105. These tables come in a variety of options as well. They can range from 9 feet to 22 feet. Unlike pool tables, room access is a consideration. For this reason, we make site visits to make sure we can fit the table into the room. We specialize in matching everything. 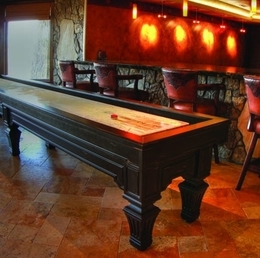 A lot of customers will start with a pool table and shuffleboard, and then add a custom bar to match. Down the road, customers can add custom card tables that convert into a dining table that matches. We specialize in getting everything to complement everything else. We can provide a whole game room. Visit Royal Billiard & Recreation at 2622 Bethlehem Pike in Hatfield, Pa., or call (215) 997-7777 or RoyalBilliard.com for more information.